THE YEARS BETWEEN 2005 and 2009 were not good for oyster growers and harvesters along the Northwest Coast. During that period, two area hatcheries saw the mortality rate of their larvae jump to 80 percent. These massive die offs led to a production decline of 22 percent and a 13 percent decline in gross sales for the industry, eventually earning the notorious moniker the “Oyster Seed Crisis.” The crisis would later be pinned on ocean acidification, a lesson that a recent survey suggests members of the shellfish industry have taken to heart. The survey, which comes out of Oregon State University’s College of Earth Ocean and Atmospheric Sciences, suggests getting hit in the pocketbook has made the West Coast shellfish industry keenly aware of ocean acidification’s impacts. The survey is the work of Becky Mabardy who conducted the research as part of her graduate work with George Waldbusser and Burke Hales, two OSU researchers who have teamed up to study ocean acidification’s effects on the West Coast’s shellfish industries. (See the CIRCulator article “Waldbusser and Hales Join Up to Study Ocean Acidification”.) What Mabardy’s work reveals is an industry concerned with its future under ocean acidification. Ocean acidification is the common name for what happens when carbon dioxide from sources such as fossil fuels dissolves in seawater, lowering the water’s pH. The lower pH levels can wreak havoc on the metabolism of multiple organisms, including salmon smolt, and has especially deleterious effects on shell-forming creatures. Not surprisingly, those in the business of earning their living from shell-forming creatures should be concerned. Mabardy and colleagues’ work suggests they already are. The survey queried some 86 members of the shellfish industry in Oregon, Washington, and California. (For the purposes of the study, the researchers defined “shellfish” to mean oysters, clams, geoducks, mussels, and abalone.) Nearly all of the survey respondents reported they had heard of ocean acidification, and over half of respondents reported ocean acidification had already negatively affected their business. Of those respondents who had experienced the negative effects of ocean acidification, nearly all were “extremely” to “very concerned” about ocean acidification. Whereas 64 percent of respondents who had not felt ocean acidification’s effects were still “extremely” to “very concerned” about the phenomenon. To put their numbers in perspective, the OSU researchers compared their shellfish industry numbers against survey data taken for the United States as a whole. The industry’s concerns, it turns out, are well ahead of the national curve. Mabardy and colleagues found that only 20 percent of the U.S. public thought ocean acidification was a real problem happening today, whereas over 80 percent of the West Coast Shellfish industry respondents thought the phenomenon was real and already happening. Likewise, while roughly 20 percent of the general public thought they would see the effects of ocean acidification in their lifetimes, some 90 percent of shellfish industry respondents thought they would see ocean acidification’s effects in their lifetimes. Arguably the more pivotal question the researchers were interested in asking was just how confident members of the West Coast shellfish industry felt regarding their ability to adapt to ocean acidification. Here the responses were a bit of a mixed bag. Of the survey’s respondents, 52 percent felt they were “somewhat” able to adapt, 29 percent reported “I don’t know,” 9 percent reported they were “not really able to adapt,” and only 7 percent reported they were “definitely” able to adapt. Mabardy and colleagues end their paper by suggesting awareness of ocean acidification and its impacts could ultimately help our region’s shellfish industry adapt. The survey was funded by CIRC’s partner organization Oregon Sea Grant. Nathan Gilles is the managing editor of The Climate Circulator, and oversees CIRC’s social media accounts and website. When he’s not writing for CIRC, Nathan works as a freelance science writer. Other Posts by this Author. 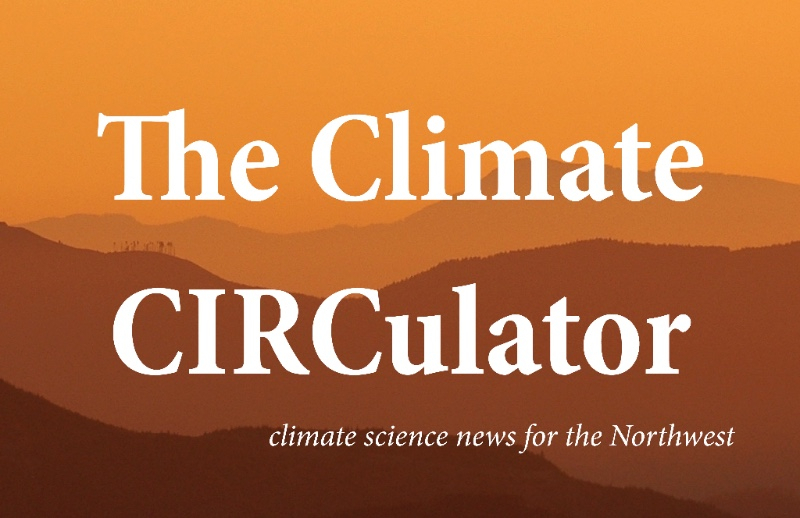 Stay up to date on the latest climate science news for the Northwest, subscribe to the CIRCulator. Next Post Whither Wetter Winter Weather?